Working with Carlo, Renee, and Concrete Temple Theatre staff has been a joy and an enriching experience for me, my staff and especially the senior participants of Sirovich Senior Center. You are true artists- always curious, bold, open to endless possibilities, imaginative, creative. Our lives are enriched in your sharing! Yesterday was FANTASTIC!! Carlo and Renee were so inspiring both as people and as artists, what they make and their views on what they do. So cool! We were all in complete awe. Concrete Temple Theatre believes in empowerment through creativity. Our goal is to enable workshop participants to release, embrace, and use their creativity, helping to empower them in all aspects of their lives. Renee Philippi and Carlo Adinolfi, Co-Artistic Directors of Concrete Temple Theatre (CTT), have been working together since 2002, and together they lead CTT’s Teaching Program. Carlo’s Italian heritage, dance background and technical theatre expertise coupled with Renee’s passion for German theatre and her skills as writer and director create a definitive aesthetic for CTT: a belief in the reflective and infusive nature of varied art forms working together to celebrate and explore the human condition. We all learn by doing. Our ability to retain and use information is enhanced, having information known versus merely understood, when one participates directly in an experience. This is true for a lecture/demonstration, crafting puppets, learning techniques for performance, or writing a theatrical text. 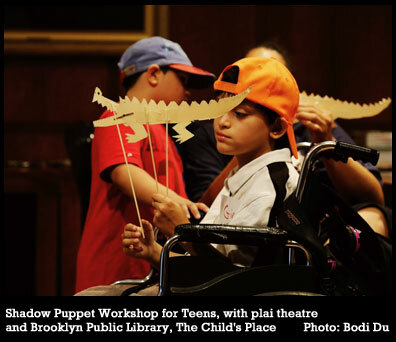 Renee and Carlo strive to make the participants in their classes and workshops the subjects of their experiences, be they senior citizens, elementary school students, college students, theatre professionals or artists. Our work is “simple” in approach yet highly theatrical. In our work, objects become characters and characters become objects, creating a fluidity in the nature of “things”. Things and bodies are constantly being transformed, from the smooth synthesis between puppets and live performers, to props having an unending array of lives and purposes, weaving what is with what is not. All of this is in service of “energy”. Focused energy moving out from performer penetrating audiences is what we believe live performance is about. This energy is in our work and in our classes no matter the discipline, as we pursue the transformation of bodies and minds. Concrete Temple Theatre was always professional, punctual, flexible, culturally-sensitive, hardworking, prepared and enthusiastic. It was a delight to work with them.